The North end of the Las Vegas Strip hasn’t done particularly well over the past decade. In fact, the stretch of Las Vegas Boulevard between Flamingo and Sahara was ground zero for the implosion of the city’s commercial real estate market. The former Stardust site sat vacant for years–originally slated for a mega-resort called ‘Echelon’ the weak economic conditions forced Boyd Gaming to ‘fold their hand’ and focus their efforts elsewhere. The Fountainbleau Hotel and Casino sat unfinished for years providing a ghostly presence to the deteriorating block. The Riviera closed and was imploded while the Sahara closed and was remodeled–and rebranded. It’s been a long time coming but there are hopeful signs for the North Strip. The 3,400 room Resorts World Las Vegas is showing considerable progress and its now slated for a 2020 opening. Sure, it was originally supposed to open in 2016 but better late than never. The former Fountainbleu property was bought by New York real estate developer Steve Witkoff. He’s partnering with hotel corporation Marriott International to open the long monthballed property in late 2020 with the new name ‘The Drew Las Vegas’. These big properties–along with an expanded Las Vegas Convention Center–is fueling hopes that the North Strip might soon become a viable part of the city’s casino economy. These positive signs are no doubt why the Las Vegas Convention and Visitors Authority has decided the time is right to put some property up for sale. 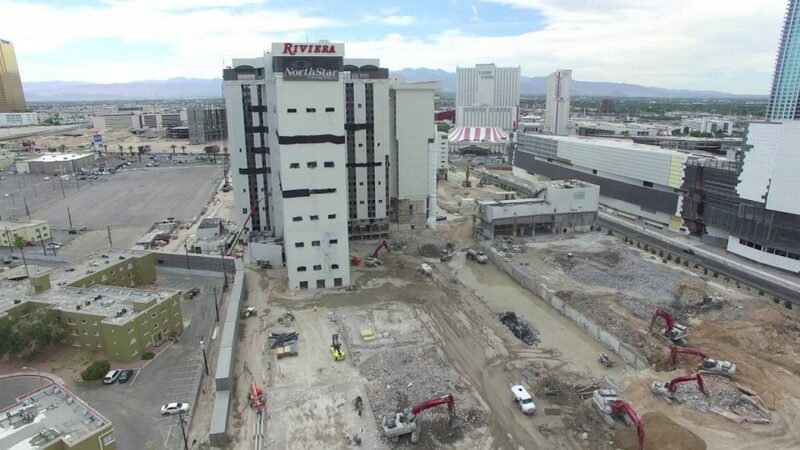 They’ve hired real estate brokerage firm CBRE Group to sell a 10 acre parcel on the former Riviera Hotel and Casino site. The LVCVA bought the Riviera in 2015 for $182.5 million. It had no interest in getting involved in the casino business, instead they wanted the 26 acres of land to expand the convention center.